Southern Sophisticate: Too Hot to Cook! With the extreme heat we're experiencing in Nashville (and across the country), outdoor grilling plans are being set aside. Seriously, there is NO way I'm going to stand outdoors near a flame when it is 108˚ degrees! And I don't want to turn on the oven either. Keeping things cool is the goal. The good news? Appetites are lessened when it's this hot. Light dinners rule. I've found the perfect meal that requires zero cooking but delivers spectacular flavor that is refreshing, hydrating and perfect for the steamiest summer night. Remove shrimp tails once defrosted. Put into a bowl with other items. 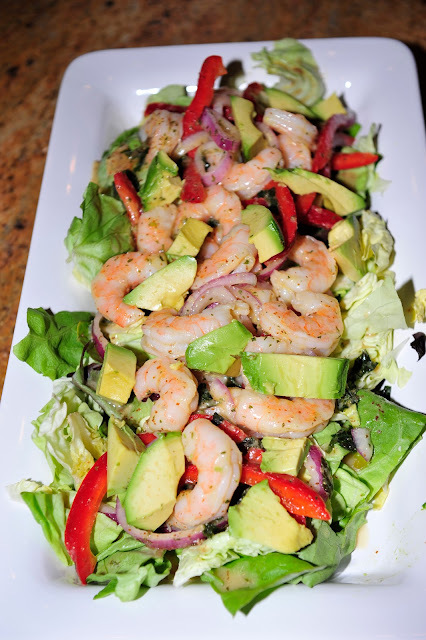 After whisking together dressing ingredients in another container, pour over shrimp mixture and chill overnight. When ready to serve, take out of refrigerator 30 minutes in advance (important step so that any hardened oil softens). Spoon over a platter of butter lettuce along with any remaining vinaigrette. Place avocado pieces on top and finish with pepper. Enjoy with a yummy glass of a glass of Groth Sauvignon Blanc and toast to lower temperatures. Don't forget to sign up to start following the Southern Sophisticate over on the sidebar!